Automatically inflates two balloons to the same size at the tap of the foot pedal. 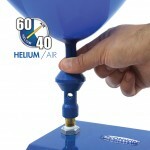 Great for arches, columns and other classic balloon decor. 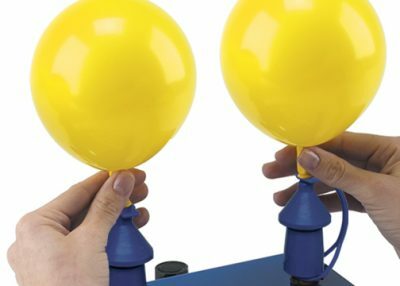 The digital control panel allows you to easily set and adjust the inflation cycle by tenths of a second to accurately size balloons. 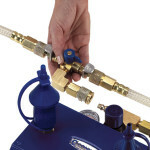 Adjustable regulator allows for unlimited size settings and size consistency from a full to empty cylinder. 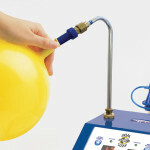 Primary Regulator features a 6-foot supply hose with a latex push valve for manually inflating individual balloons. 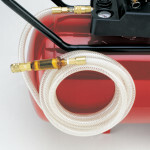 Electric inflator operates from a helium or nitrogen cylinder, or an air compressor. 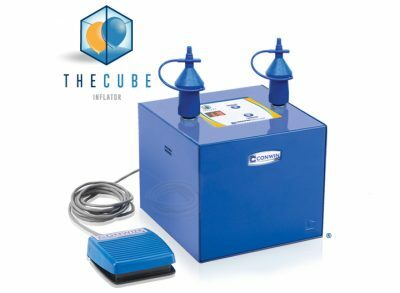 * When using an air compressor with the The Cube Inflator, it’s recommended you use Conwin’s Air Compressor Hook-Up Hose to ensure moisture and dirt does not enter the inflator. The digital control panel allows the operator to adjust the cycle time in tenths of a second. 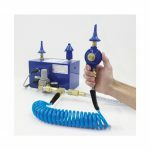 The primary regulator operates from a helium or nitrogen cylinder and features a hand-tight connection, 6-foot supply hose with a latex push valve, quick-disconnect fitting, pressure gauge, disc tyer post and a ribbon cutter.